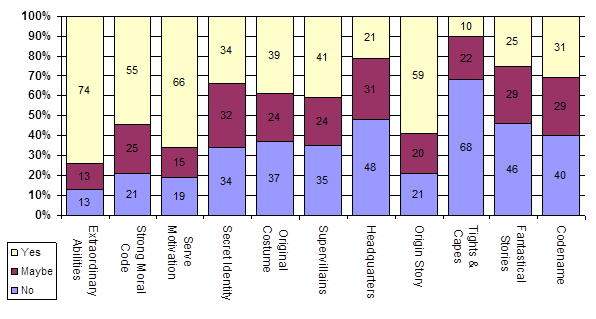 A series of quantitative and qualitative questions were asked of individuals around the world on: whether or not certain characteristics defined superheroes; creating their own superheroes; speaking about the first and most famous superheroes; labeling a variety of characters as superheroes; speaking about the reality of superheroes and their cultural heritage. This first phase of the analysis will provide frequency information on the closed-ended items from the survey: the definitions of superheroes; the recognition of characters as superheroes; and, the uses and perceptions of media from the United States. 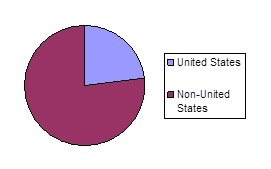 Of the 112 participants, 26, or 23%, grew up in the United States. Of the 77%, or 86 participants, who did not grow up primarily in the United States, the breakdown of their birth countries shows an array of American, European, Asian, Middle Eastern, Oceanic, and African cultures. The average age of the participants was 28, with a range from 11 to 70. The vast majority of the participants were male (74%), with only 23% female, as several participants refused to indicate their gender. The participants were asked to indicate how often they consumed on average in the past year various types of media produced by the United States: movies; television; comic books; video games; and, cartoons. The following table provides their answers for these five items, arranged in descending order of average consumption behavior. Notice that movies, television and cartoons appear to be the primary media sources – and thus potential sources for exposure to superhero genre conventions – across the sample’s average consumption behaviors. Video games appear to split between those who play them regularly and those who do not. 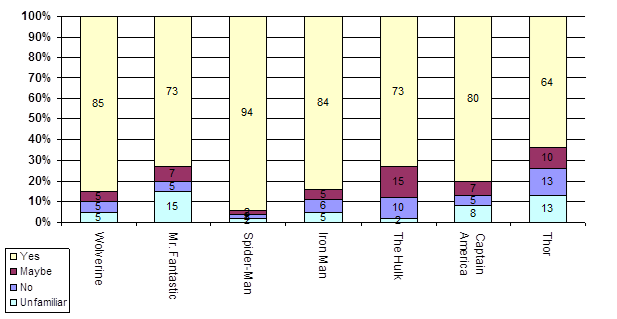 Finally, comic books appear to be the least consumed media amongst the participants. This first section relates the frequency of endorsing certain conventions as necessary for defining a character as a superhero. 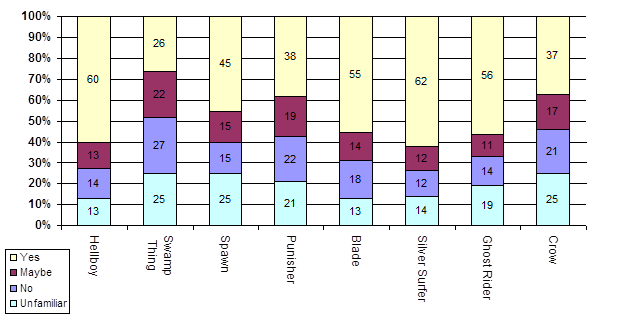 Eleven items were used in the survey; these items were based on a discussion by Peter Coogan as to what defines a superhero (Superhero: The secret origin of a genre, 2006). 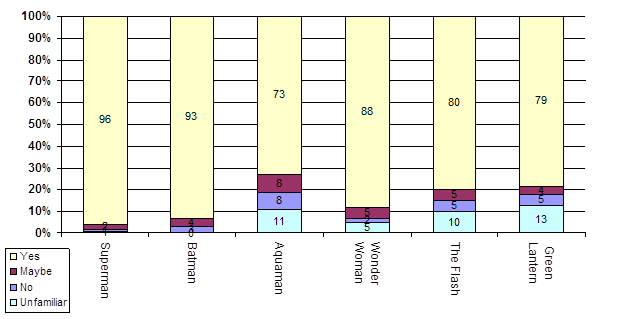 Below is a table showing the percentages of people who agree or disagree or are not certain that the specific characteristic is necessary for defining a character as a superhero. The most important characteristics agreed upon from various cultures are: Extraordinary Abilities; Serve Motivation; Origin Story; and, Strong Moral Code. These are the top four characteristics with the highest percentages of agreement for being necessary as part of the definition. Notice there is nothing about the appearance of the character. Instead, the actions of the character take precedence, as well as the inclusion of some type of origin story to explain how that character came to be. Additionally, three of the characteristics could be said to elide with other genres; that is, they are not necessarily specific to the superhero genre. Apparently the inclusion of the Extraordinary Abilities, in combination with the remaining three, pushes this character into the superhero genre. The reason for the higher importance placed on the Origin Story is hypothesized below with regards to other results. Following these top four characteristics, another four characteristics are similar enough in their endorsement by the sample as to be considered a secondary group of characteristics. These characteristics are: Original Costume; Supervillains; Secret Identity; Codename. These characteristics consist of the appearance of the character as well as conventions that are very specific to the superhero genre. And yet, their generic specificity is not highlighted as what makes them central to defining a character as a superhero. A possible reason for this is discussed next. Towards the bottom of the list is the requirement for the character to be in some form of Fantastical Story. The lack of endorsement for this item may be due to the prevalence of the realism trend in superhero films that have been disseminated around the world since 2000. Unfortunately, I had not thought of asking specifically from where the sample knew their superheroes. 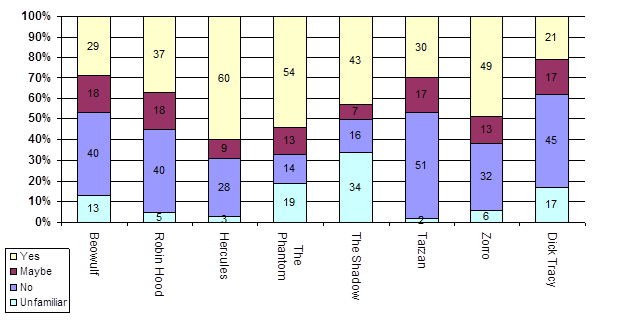 However, the sample was more likely to watch American movies, television and cartoons than read American comic books. It appears the worldwide knowledge of superheroes has been more influenced by their moving portrayals rather than the comic book canon from which they arise. The prevalence of the movies could also explain by the visual appearance of the superheroes was less important than his or her actions. Of course there remain visually iconic superheroes whose appearance is little changed from comic book to film (i.e. Superman, Batman, Spider-Man); but, there are also those figures whose appearance as changed (i.e. X-Men, Fantastic Four, Punisher). Also, movies, television and cartoons show moving pictures that allow for the portrayal of actions in a way that comic books cannot. A consumption of comic books may heighten the primacy of the visual depiction, whereas a consumption of moving portrayals may heighten the primacy of the actions. Not tremendously surprising, Headquarters was listed towards the bottom of the list. Few superheroes actually have headquarters or bases of operations. What is most striking is perhaps the heightened lack of agreement that a superhero must wear tights and capes. This visual appearance has for so long been the points of reference made in parodies and satires of superheroes, from The Tick to The Incredibles. The fact that this characteristic is at the bottom of the list again serves to showcase the primacy of motion pictures and the realism slant taken in them. Participants were given a range of characters and asked to indicate if they believed the character was or was not a superhero. The range included established superheroes such as Superman and Spider-Man, as well as anti-heroes, classical heroes, and Japanese characters. What resulted was a gauge as to how well superheroes are known through being disseminated around the world, as well as how non-traditional superheroes are seen as relating to the superhero genre. 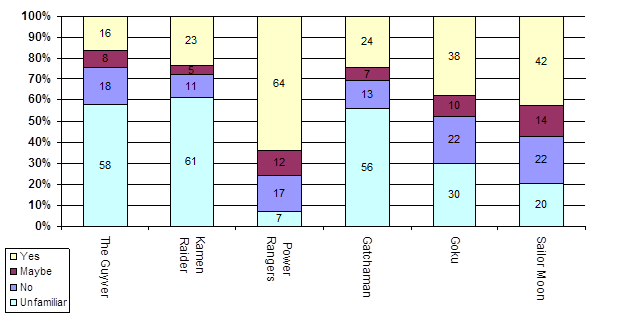 This range of characters are divided into four charts for reporting: DC characters; Marvel characters; Classical characters; and Japanese characters. One character that does not fit this categorization was Mr. Incredible, from the Pixar film. He rated high on the list, with 75% percent of the participants agreeing he is a superhero, with 15% unfamiliar with the character. As is apparent, these DC and Marvel characters are rather widely known across the world, with Thor the least recognized – although there is most likely confusion between the superhero and the Nordic god from mythology. Of the remaining characters, the ones with the highest unfamiliarity either have not had a motion picture (Captain America, Green Lantern, Aquaman, The Flash) or had a film that did not perform as strongly as hoped (Mr. Fantastic). Of the anti-heroes most likely seen as superheroes, all four have had recent films and film franchises based on them. The least likely to be seen as a superhero, Swamp Thing, has been out of such mass media for over a decade, unlike the rest of the characters. Although Spawn, Punisher, Ghost Rider and Crow have all had motion pictures based on their comic book characters, none performed as well as the others. Interestingly, Silver Surfer was not that much lower than Mr. Fantastic in being called a superhero, and was perhaps slightly better known; this is perhaps due to Silver Surfer being in the name of the second Fantastic Four movie. Of the legendary characters, Hercules was seen more as a superhero, although like Thor there may be confusion between the demigod and the Marvel character. Beowulf was the least familiar of the characters. Of the pulp heroes, The Phantom was seen more as a superhero, followed by Zorro. While Tarzan was the most recognized, he was one of the least recognized as a superhero. The Shadow was the least recognized, but of those who were familiar with him he was seen more as a superhero. Of the Japanese characters, the Power Rangers were the best known and the most seen as superheroes. According to the date, the older the character, the least well known the character was and the least seen as a superhero. Of the two remaining animated characters, they were both relatively well known and seen as superheroes, with Sailor Moon edging out Goku. Across all the characters, the American characters classically defined as superheroes were seen as such, and the most well-known. The participants’ answers to defining superheroes could be based on their familiarity with these DC and Marvel characters, coming to them primarily via their movies, television shows and cartoons. Then, using these definitions, the participants may judge other characters, from the United States and other countries, as to whether or not they match the characteristics seen in the DC and Marvel characters. However, the fact that non-traditional superheroes were also seen by some as superheroes indicates the looseness of the categorization scheme as applied to characters from various genres and cultures. This looseness could indicate the local culture’s and/or individuals appropriation of the genre conventions to their interpretation of other characters – from the reception to the creation of such characters. The open-ended questions will be analyzed in a follow-up report to understand if such appropriation is being utilized by the participants in how they describe two generic characters as well as themselves as abiding by the superhero genre conventions. Additionally, their discussions about seeing superheroes as prototypically from the United States will be examined to see if their arguments about the dissemination and cultural/individual appropriation of superheroes mirror this report’s analysis.